Juventus vs. Chelsea : 20 November 2012. The church bells of my local village church struck three o’clock and a few minutes later I was away on my latest European adventure with Chelsea Football Club. I had been awake since 1.30am, but only had a couple of hours’ sleep to my name. Up on Salisbury Plain, near Shrewton, I passed an owl, sitting still in the middle of the road. It reminded me of the owl that I drove past up on the Mendip Hills on my way to Bristol Airport for the game with Barcelona last season. I hoped for a similar result. I was evidently grabbing at straws and looking for any good fortune. Make no mistake; Juventus away was a stern test for our faltering team. It was the game of the season thus far. A draw would be fantastic. A win would be phenomenal. I covered the 125 miles to Gatwick in two hours. The roads had remained dry and clear of traffic. On the journey, there was time for me to filter through all of the previous European trips that I had enjoyed during the past eighteen years. This second trip to Juve would be my twenty-fourth such trip with Chelsea. I quickly ranked the top five trips (Munich 2012, Barcelona 2012, Stockholm 1998, Turin 2009 and Seville 1998 ) and then thought about worst trips. To be honest, apart from a couple, all have been fantastic and I didn’t bother ranking the worst ones. Of those twenty four excursions, I had been to Spain six times, Germany five times and the Turin trip would be my fifth to Italy. There were a few familiar faces on the 0700 Easyjet flight to Milan Malpensa. I thankfully managed an hour of sleep. Every hour counts. We landed in Italy at 9.45am. Milan Malpensa was last visited by me in 1980 and 1981 on family holidays to the Italian Riviera. I quickly recognised the forests which surrounded the runway. Through passport control, the instant aroma of coffee was overpowering – “benvenuti in Italia!” – and I just had time for the first cappuccino of the trip before I boarded the Sadem bus at 10.30am which took us to Turin. While the other coach passengers either slept or listened to music, I was taking note of everything. Maybe it was the caffeine inside me, but my eyes were everywhere. In truth, the road was rather bland, but I did not care one jot. The mountains of The Alps were our constant companion to the north and I kept scouring the rural Italian landscape for iconic images. Old farmsteads, woodland copses and the amazingly flat Po valley laid out to my right. Overhead, there were blotchy clouds. The Alps kept getting closer. They were snow-capped, of course, and quite beguiling. We passed by the town of Vercelli, home many years ago to one of Italy’s great teams in the early years. Pro Vercelli had won the First Division, in all its guises, seven times before Juventus had their first “scudetto” to their name. Ah, football. Football was back in my mind again. As we approached the outskirts of Turin, I was sitting bolt upright and my arms were hugging the seat rest in front, attempting to gain a good vantage point of the twin sights which were dominating my thoughts. After a few moments of uncertainty, there it was. The famous basilica which overlooks the entire Piedmont capital, was sitting high and proud on its very own hilltop. It was midday and the sky suddenly lit up with a bolt of sunshine. After around twenty minutes, I just glimpsed the other iconic sight which I had hoped to see. The two roof supports – the sole remainders of around twelve such structures from the old Stadio delli Alpi – of the brand spanking new Juventus Stadium were spotted a few miles to my west. While everyone else on the coach was still slumbering, I had welcomed myself to the city. To be honest, I wanted to leap to my feet, grab a microphone and become a tour rep for a few minutes. At 12.20pm, we had been deposited outside the Porta Sousa train station. I decided to walk the mile or so to my hotel. The Turin streets, some cobbled, were quiet. There was a slight chill to the air, but – “che bello” – it was fantastic to be back. I texted my friend Tullio, who I first met on that 1981 holiday in Diano Marina – that I was in his city. At 5.45pm, the night was falling and I gathered myself together and headed out. I had arranged to meet Tullio around a mile to the east, right outside the church where he married Emanuela in 1999. The air had chilled further and the rush-hour traffic was thudding over the cobbled streets. As I walked over the bridge, I noted that Monte dei Cappuccini was lit with blue lights. Was this another good sign? I was desperate for good omens. The River Po, with lights reflecting along its western edge, was magnificent. I was so happy to be back in the city once more. This would be my seventh trip to Turin for a Juventus game. Those waters run deep. Tullio arrived, his car lights flashing, and I clambered into his car, almost too excited for words. We shook hands and then embraced. It was, of course, wonderful to see him once again. I first visited Turin in 1987 – early November – and I can well remember walking the three miles from Porta Nuova to the old Stadio Communale for a Juve vs. Panathinaikos UEFA cup game. With each step on that cold, dark night, my excitement rose, with memories of Anastasi, Rossi, Boninsegna, Bettega and Zoff racing through my mind. It was, in fact, my first ever UEFA game of any description. How excited I was to turn a corner and finally set eyes on the Juve supporters crowding, three hours before the kick-off, outside the Curva Filadelphia. On that particular night, I sold my first ever football badges – “emblemi inglese, due mila lire” – before disappearing into the Curva Maratona to witness the bianconeri at play for the first time. Just one memory of Turin. There are hundreds. Tullio’s wife Emanuella welcomed me into their apartment and the two girls, Sofia and Lucrezia, soon arrived on the scene, though their gaze soon returned towards the cartoons on the TV screen. Of course, just under a year ago, I was with my other Italian friend Mario – from 1975 this time – in Germany when Chelsea played Michael Ballack’s Bayer Leverkusen. Was it really 1985 when the three of us were last together, playing football on the beach outside the Hotel Gabriella in Diano Marina? How time flies. Emanuela, who is just starting up a fledgling catering company with a friend, served up a lovely Italian feast, alongside a couple of lovely local wines. We chatted and caught up and – to my surprise – the football talk was kept to a minimum. We ran through our two teams. I told Tullio that I liked the diminutive Giovinco. Tullio drove me back into the city and we said our goodbyes. Tullio would be attending the Chelsea match on the Tuesday with some friends; he had managed to get hold of a ticket from a friend whose brother is a presenter on the Juventus TV channel. Last time, in 2009, Cathy managed to get Tullio a ticket via a contact at Barclay’s in Turin. I met up with Alan, Gary, Daryl and Neil in the “Murphy’s Six Nations” pub on Corso Vittorio Emanuelle II, the main east-west road in the city. They had arrived in the city from Genoa. A couple of pints there were followed by a few more at “Zilli’s Bar” on the other side of the road. A few more familiar faces; Rob, Pauline, Peter, Callum and Digger. I spent time talking to a couple of Chelsea friends. Rob was waxing lyrical about the time that he went to that infamous game in 1975 at White Hart Lane. It was, actually, his first ever Chelsea game, but he was locked out. He only got in towards the end of the game when Chelsea were losing 2-0 and the gates were opened to let the early-leavers depart. He went into great detail about parts of the day, but memories of the game were scant. I joked with him that he was able to remember what he had for breakfast in the café on the Tottenham High Road beforehand, though. To be honest, I expected this main drag to be busier. I was worried that we would only have around 1,500 out of our allotted 2,400. I decided to head back to the hotel at 2.30am after the bar was invaded by some youngsters who were intent on singing songs which I found to be unacceptable. I don’t appreciate songs lauding John Terry’s alleged racist nature. Things got a little heated. I soon left. On the day of the game, my plans were already sorted. I had a fantastic lunch arranged for 12.30pm at the “La Pista” restaurant which sits on top of the old Fiat Lingotto factory where Tullio’s grandfather worked all his life. I had a lie-in, but left the hotel at 11.45am. Unbelievably, as I stepped out of the hotel, glimpsing up at the cloudless sky, I heard my name being called. It was Tullio’s mother! She was with Tullio’s father. What a joy it was to see their faces! I had not planned to see them on this trip. Their house was only a mile or so away and they had walked up to my hotel to leave a little present for me in reception. What an amazing coincidence that I should chose to leave the hotel at that exact time. We were all full of smiles and we gave each other big, big hugs. I was buzzing. This city was endearing itself to me all over again. I caught the metro down to Lingotto at midday. For film aficionados, Lingotto is famously featured in the 1969 film “The Italian Job” when a bank heist takes place in the city. The famous car chase ends up on the test-track on top of the Lingotto factory. It is not far from the old Campo Filadelfia stadium and the Stadio Olimpico, former and current homes of Torino. Yes really. Another good omen? I spent well over an hour in the fantastic restaurant at Lingotto. I’m not a foodie at all, but decided to treat myself. I had a table overlooking the old test track. The view was simply stunning. The Alps to my left, the hills to the right and the dramatic curve of the banked test track ahead of me. It was a perfect day. The food was exceptional. I typically spent the time people-watching; an elegant couple to my left were having the Full Monty, around eight courses, and I watched as truffles were weighed out on some scales. Ahead, a noisy table of sixteen, one of whom was wearing a Chelsea sweatshirt. Maybe he was a Torino fan. They all stopped to listen as the patriarch spoke; there was hushed reverence. I almost expected Roman Abramovich and his entourage to arrive and use the vacant table away in the distance. I wasn’t used to such decadent surroundings, but I loved every minute. I spent a while mulling over my love affair with Italy. It was a time for quiet introspection. There was a time, circa 1988, when I had no concrete career plans and I semi-seriously mulled over the idea of living in Turin and attempting to make a living through selling football badges at games in Italy. I’d attempt to learn the language. Maybe six months in Turin. Six months in England. La Dolce Vita and all that. Dream on. It never happened. I didn’t have the self-confidence to go for it. In the restaurant at Lingotto, I daydreamed of a life that could have been. I smiled to myself. I wasn’t bothered. After the meal, armed with my camera, I circumnavigated the test-track. Ever since I have been coming to Turin, visiting it has been my own personal holy grail. And here I was, walking the famous banked curves for the very first time. My camera went into overdrive and I loved it. Thankfully, there were no clouds in the sky. The snow-capped mountains to the west were clearly visible. To the north, the ornate tower of Il Mole Antonelliana was magnificent. I was in my own little world and I loved it. With sadness, I left the roof area and descended into the shopping centre. I popped into the Juve store, but neglected to buy anything; I was in Turin for Chelsea. It didn’t seem right to buy a Juve item. In a boutique, I was warmed to see the appearance of some Henri Lloyd pullovers, sweatshirts and trousers alongside the more typical Italian names such as Armani. There was also a Clarks shop nearby. England fights back. The Italian Job all over again. I made my way back into town and met up, briefly with Josh (theangryintern) who was outside “Murphy’s” with Cathy. I set him off on a quick walk of the city to give him an idea of its charms. I then returned to the hotel to recharge batteries; my mobile phone, my camera, my body. At 5pm, I was back out again. Camera in hand, I shot a few memorable photos of the area around Via Roma, the street which houses the up-market shops such as Fendi and Boss, Prada and Dolce & Gabbana. This street runs north south from the Porta Nuova up to Piazza San Carlo and beyond. Although I love it, its architecture is brutal and easily recognisable from the facist years of Benito Mussolini. In the city from November to January, there is a “Festival of Lights” and I captured a few iconic images. It was 5.30pm and the city was calm. Juve fans were hardly visible. I popped into a gorgeous bar on Piazza San Carlo and enjoyed a crisp beer, then helped myself to the plates of “free nibbles” which were piled high on the bar. As I departed I said “buona note e forza Chelsea” to the cashier. She smiled. Maybe she was Toro, too. At 7.45pm, we were hurtling through the evening traffic. Fifteen minutes later, the cabbie – at last, a Juve fan – dropped us off at the north-eastern corner of the stadium. Pulses were racing now. Good times. On the cab ride, I had mentioned to Daryl that I remembered talking to him when we first met up in 1992 about my travels around Europe selling badges and the trips to Italy to see Juventus in particular. I remembered him commenting that, in all seriousness, he was a tad jealous, since all he had done was “watch Chelsea.” At the time, the remark made me wince since I was surprised anyone would be jealous of me. Since then, Daryl – plus all of my other mates – have had a merry dance, following our beloved team all over the continent. Daryl remembered the comment and smiled. I was last on this spot in May 1999, the weekend of Tullio and Emanuela’s wedding, when I awoke bleary-eyed on the Sunday and made my way, again by cab, to the old Delli Alpi for the weekend’s other major attraction; Juventus vs. Fiorentina. On the Wednesday, Manchester United had been in town, memorably defeating Juve 3-2 in the CL semi-final after being 2-0 down. It was, allegedly, Roy Keane’s best ever game for United. It was United’s version of our draw at Barcelona in 2012 I guess. I was pretty delicate after the excesses of the wedding reception – I memorably awoke with bloodshot eyes – but watched a Juventus team including Didier Deschamps, Thierry Henry and Zinedine Zidane defeat the hated Viola 2-1. Current manager Antonio Conte scored the winning goal way deep in injury time and then infamously ran towards the away section in the north-east corner and pulled the black and white corner flag out of the ground and waved it victoriously at the Fiorentina fans. I have this all on camcorder film somewhere. The others were keen to enter the stadium, but I excused myself and took a few moments to let things settle, to take it all in. Outside, there were many souvenir stalls selling Juve gifts. There was also the ever-present smell of wurst being grilled. A German food being sold at an Italian game? Sure. The smell took me back to nights selling badges in Turin, Milan and Verona. There was a heavy police presence outside our gate, but I was quickly through the security checks. My camera hung around my neck, but I was allowed in. At each of the three checks, I sweet-talked the stewards. There were smiles at each of these interjections. I took some atmospheric shots of the stadium, with the moon high above. The stadium sits on the exact site of the Delli Alpi. Because the lower bowl is below street level, it doesn’t look too imposing from the exterior. It is a very photogenic stadium though. The twin roof supports are painted white, red and green, mirroring the Italian flag, but the design reminded me, bizarrely, of the 1990 World Cup mascot, too. Strangely, Google Earth still shows the Delle Alpi stadium in all its unloved glory. Yes, this was the site of the wonderful, but eventually heart-breaking, England vs. West Germany semi-final. I heartily recommend the film “One night in Turin” by the way. I slowly made my way up the entrance tunnels and the white light of the arena beckoned me ever closer. Within a few steps, there it was. The terraces were so steep. Never has a 40,000 stadium looked so large and impressive. I’ve been keeping an eye on the progress of the building of this new stadium for quite a while. To my knowledge, it is the first-ever publicly funded stadium in Italy. 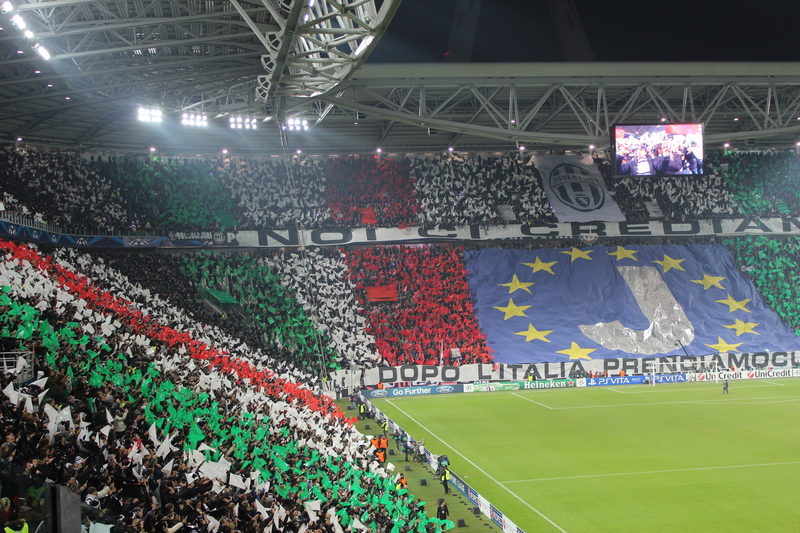 I even watched the official opening in August of last year in a special 45 minute “Juventus / Facebook” link. It was a magnificently choreographed evening. And here it was, in the flesh. It was more spectacular than I had hoped. The Chelsea fans were strong in number. Thank heavens. I’m not sure where they had all been hiding during the day, but it was stirring to see so many had traveled. It was soon time for me to become reacquainted with the Juventus anthem which I have been “YouTubing” for ages. The flags were waved, the music boomed out. Out came my “pub camera” to record it all for posterity. I must admit to being just a little dewy-eyed at this moment. I am sure that Tullio, over on the far side, was singing along to the words. “Juve, storia di un grande amore. Bianco che abbraccia il nero. Coro che si alza davvero, solo per te. Juventus in black and white shirts, white shorts and white socks. Chelsea in all blue. So, this was it then. The night of destiny in Turin. I prayed that we could withstand the onslaught in the first twenty minutes. We had heard that the team would be without Fernando Torres. Eden Hazard to play centrally. Having Cesar Azpilicueta play wide in the midfield brought back memories of Ryan Bertrand in Munich. Early Juventus pressure was not a surprise. A wonderful save from Petr Cech at his near post had us all applauding. The home team kept attacking, but a break by Oscar on eight minutes gave us hope. It was a very strong run and he drew a defender before feeding in Eden Hazard. A low shot was deflected by Gianluigi Bufon into the goal’s side netting. This gave us hope. The old favourite from 2009 was aired. Juventus came again and another fine save denied Marchisio. Chances for Ramires and Hazard gave us hope. In truth, Juventus were enjoying most of the ball. At least we were creating some chances, though. On 37 minutes, a speculative shot from Quagliarella took a wicked deflection and Cech was beaten. The tifosi roared and our hearts sank. As if to rub it in, the Juventus DJ played a short burst of “Chelsea Dagger” after the goal was scored. A dagger to the heart. Although Juventus had most of the ball, the thoughts among my little group of friends were that we had played reasonably well in the first period. Mikel was our best player I thought. Oscar showed good strength. Our play seemed to deteriorate with each passing minute in the second-half. We all thought Cahill had fouled Vucinic inside the penalty area and we breathed a collective sigh of relief when the referee didn’t agree. Juventus attacked at will and some of our positional play was worrying. Azpilicueta, who had been fine, was replaced by Moses. Soon after, Juventus went further ahead when the ball was played back to Vidal. His shot was deflected again, this time by Ramires and Cech was beaten. Another dagger to the Chelsea heart. Torres came on for Mikel. A surprise that. He tidily played in Oscar to no avail. We were hoping for a miracle to be honest. The news from Denmark had been to our favour in the first-half with Shakhtar losing; they were now winning 5-2. Giovinco broke through and beat the offside trap. Petr Cech did all he could to block, but the little Juventus attacker stroked the ball into an empty. This was truly a grim night. Kev from Bristol did some calculations; it transpired that we have to hope for Shakhtar to defeat Juve while we win our last game against Nordsjaelland. We shuffled out of the stadium while some young oafs took their frustration out on some persplex glass which kept us separated from the locals, beating it constantly. We waited in silence. The mood was of solemnity. I wasn’t happy. We then boarded a fleet of coaches to take us back to the city centre. We were packed in like sardines. The mood was very similar to the mood after the game in Naples in February. The boys had to be up early in the morning, so at about 1.30am we all returned to our respective hotels. There was no need for me to get up too early on the Wednesday. At 10am, I was slowly coming around. The defeat was heavy in my mind. Should we fall into the Europa League, how will we cope? How will I cope? Big questions. In one single moment, I was angry, saddened, crestfallen, bewildered, upset, confused and heartbroken. The texts started flying around. It was true. How could my club dismiss the services of one of its greatest ever heroes so easily – and with the absolute absence of dignity – in such a despicable manner? This man had won us the FA Cup and the European Cup in May. This man had taken charge in dire circumstances and yet had got the team to respond admirably. Only a month ago, we had followed up a 2-1 win at Arsenal with a 4-2 win at Tottenham. Only recently, we were top of the league. Do we know judge our managers over just six games? My brain was numb for the rest of that day in Turin. I disappeared over the bridge and had a morning cappuccino in a café in Piazza Crimea, then had a conversation in Italian with two locals as I bought the pink “Gazzetta” sports paper. I likened Chelsea to an Italian club, changing managers every six months. I only really know “football words” and “swear words” in Italian, but my vocabulary allowed me to talk for quite some time. I walked up to Monte dei Cappuccini to take the last few photographs of my most recent trip to Turin. The city was oblivious to my sorrow. I guess that it was almost inevitable, knowing how the hand of probability works, that on one visit there would be sadness. Turin has certainly known its share of footballing grief, what with the twin tragedies of Superga and Heysel. Those two disasters have formed part of the collective psyche for the respective supporters of Torino and Juventus. Without wishing to be disrespectful, impolite or churlish, the city of Turin has now become a black spot in the history of my beloved Chelsea Football Club too. This entry was posted in Season 2012-2013. and tagged 2012-2013, Antonio Conte, Fiat, Heysel, Italia '90, Italy, Jon Obi Mikel, Juventus, Pro Vercelli, Roberto di Matteo, Superga, The Italian Job, Turin by Chris Axon. Bookmark the permalink.